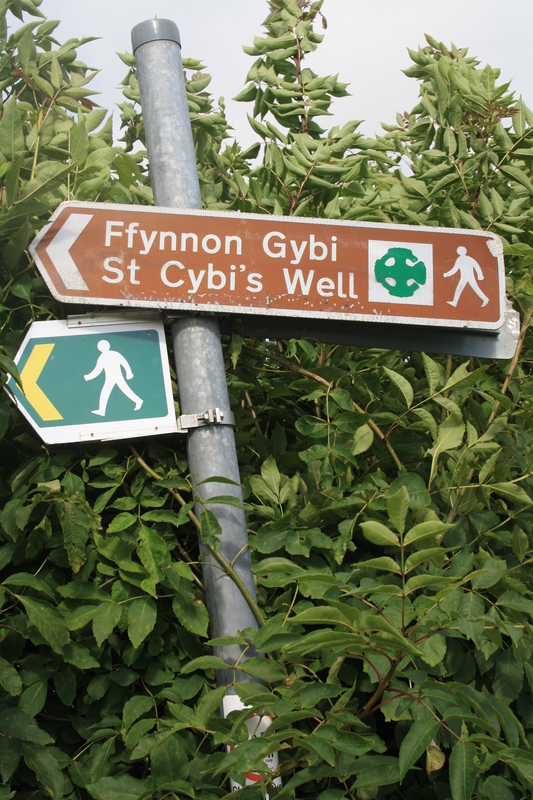 Ffynnon Gybi at Llangybi is firmly on the tourist trail, and justifiably so, the route marked from afar by a series of brown signs from the A499 north of Pwllheli. But once you finally arrive, and leave the road onto the footpath the signage ends and soon you are left facing a broad muddy water filled hole. For a minute you can be excused thinking disappointedly “Is this what all the fuss is about?”, but be assured it isn’t. 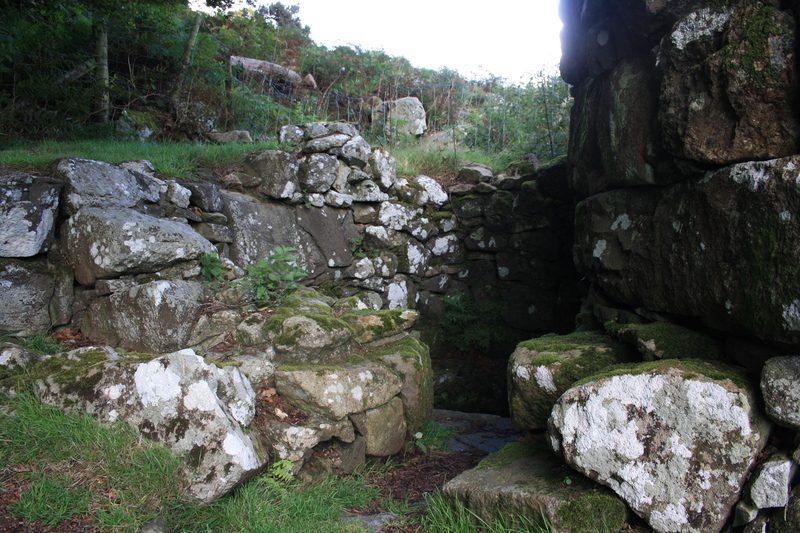 This is another well, Ffynnon Llety Plu, supposedly once associated with a pub of lodging house in the area. The path turns to the right here and Ffynnon Cybi is still another hundred yards or so away. The track to the well has clearly been a major route at one time, the remains of stone walls and houses can be seen beside a wide track. It turns left onto a bridge crossing the stream and a raised stone causeway leading to the well buildings can be seen under the grass. 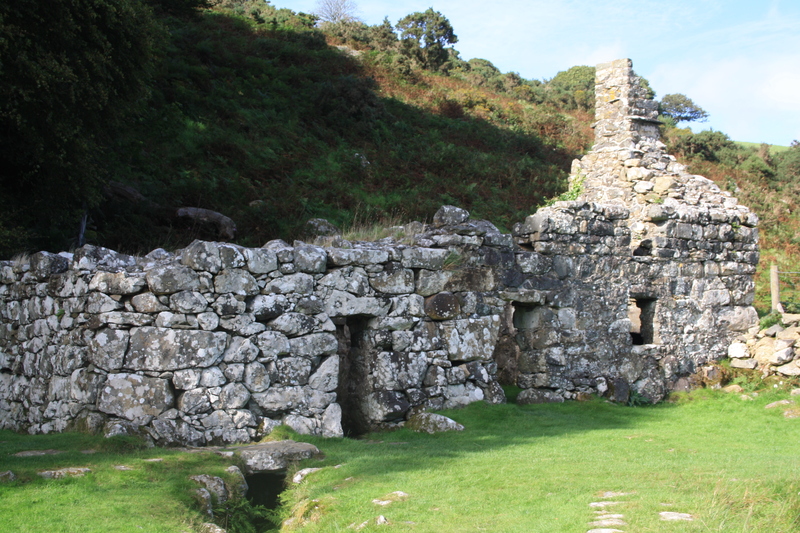 The buildings that stand now are the remains of eighteenth century buildings, on the left an enclosed bathing pool and beside it the remains of a house occupied by the well keeper. These were erected by the land owner Mr Price around 1730 after having been convinced of the efficacy of taking the waters. 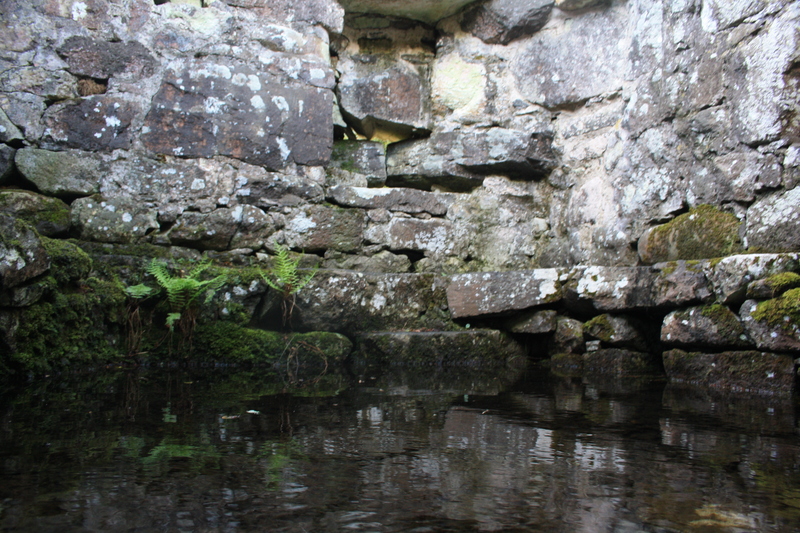 The spring itself lies immediately behind the bathing pool (in photos below), forming another small pool from which water flows into the building. 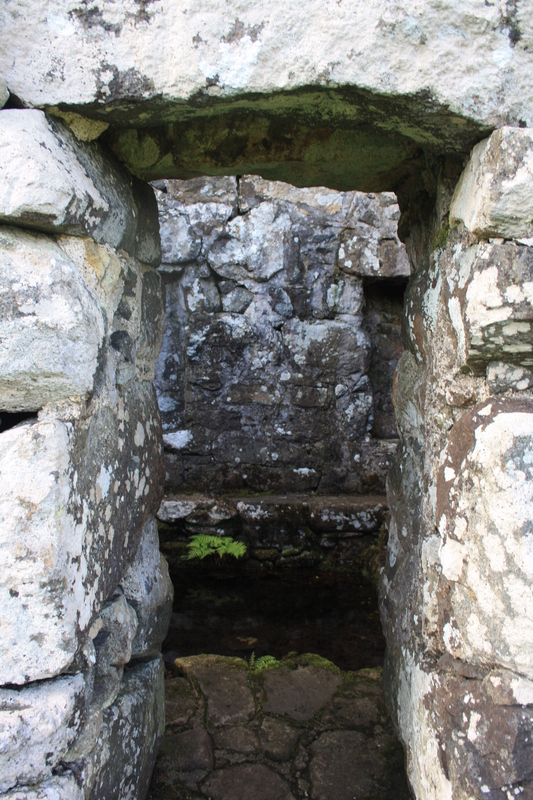 The well’s outlet is from the front of the building, through which it forms a fast flowing stream that flows through a stone lined channel across the field down towards the river. 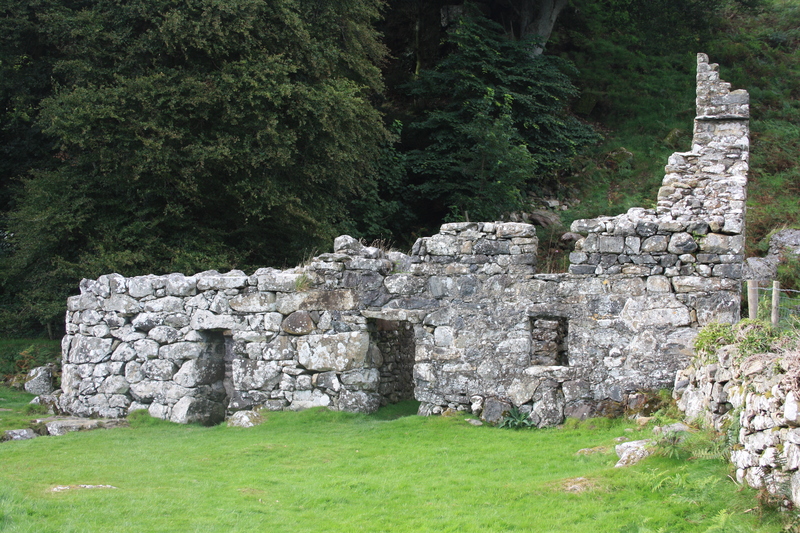 As it goes it passes through another smaller building, linked to the wellhouse by another stone path, which has at one time been a latrine block. The bathing pool itself is inside the left hand building of the pair (shown below). it is stone lined, approximately four yards square, with a narrow stone path running all the way around it. Within the walls of the chamber there are small niches in which candles and offerings have been left. 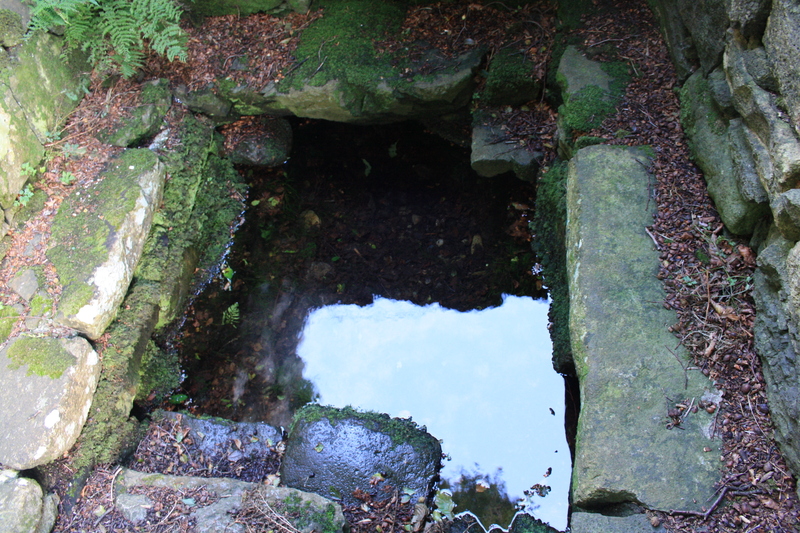 The well was a point of pilgrimage. Its waters were said to cure warts, lameness, blindness, scrofula, scurvy and rheumatism. Crutches and wheelbarrows left by cure seekers were to be seen around the well. A box, Cyff Gybi, was kept in the church to receive the offerings from grateful pilgrims. At one time it is told that an eel lived in the well. The patient stood bare legged in the well and a cure would take place if the eel coiled itself around the patient’s legs. At one time the eel was removed and people believed that the well lost much of its powers at that time. Treatment was also said to have consisted of giving patients an equal quantity of well-water and sea water, morning and evening, for a period varying from seven to ten days. They then had to bathe in the water once or twice a day, retiring after each bath to a bedchamber in the adjoining cottage where they were given a quantity of healing water to drink. The success or otherwise of the treatment was judged by whether the patient became warm in bed or remained cold, with the former condition indicating that the treatment was progressing satisfactorily. 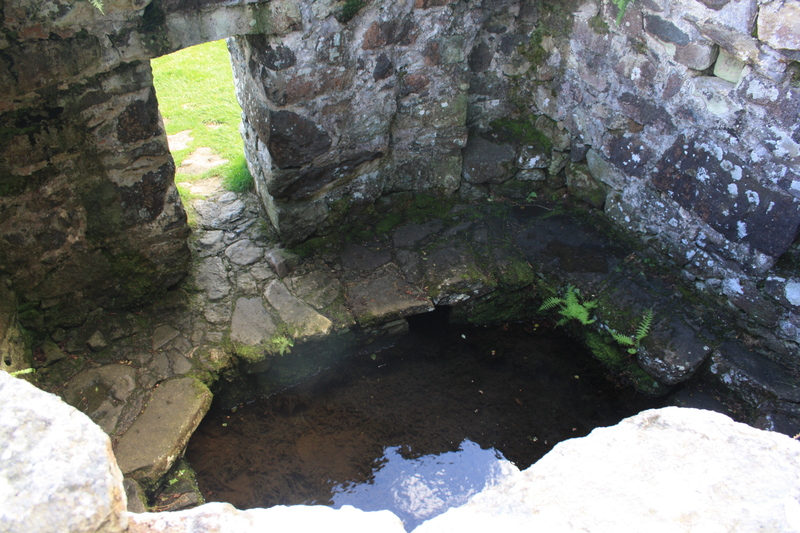 The well was also frequently used for divination, with local youths floating handkerchiefs on the water to see which way their love would go. 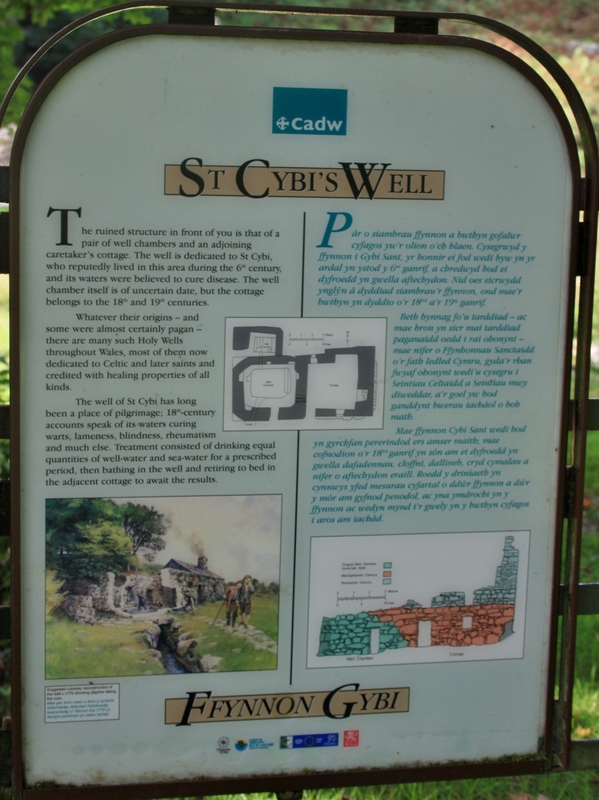 Cybi is another locally famed saint with origins far distant from North Wales. He came to the area rather late in life, apparently fleeing from a chain of disagreements and feuds he had had elsewhere. From what evidence exists he is believed to have been born in Cornwall, his father a Roman military leader or minor king, and through his mother Gwen, he was a first cousin to St David. He was educated in Cornwall and reputedly visited Jerusalem and Rome on pilgrimages before staying in France where he received his religious training. Baring Gould notes that some accounts have him staying in France until he was over 70, but this was clearly impossible. He returned to Cornwall at a time of strife in the area, and Baring Gould suggests that, maybe involuntarily, he may have become involved as a leader of a failed uprising and was forced to flee northwards. He arrived in South Wales, but was not well received by the local ruler there. Although he managed to obtain land for the establishment of two cells, he soon moved across the sea to Ireland. Again he worked on his ministry and established churches, but once again was involved in land disputes, and accused of incursion on other’s territory. Recrimination and curses followed as once again he was forced to move on, finally arriving on the Lleyn Peninsula where he founded his church at Llangybi. It was here that he plunged his staff into the ground bringing forth the waters which now flow as Ffynnon Gybi. Once again disputes arose between Cybi and the King of Gwynedd, Maelgwn. In settlement Maelgwn eventually conceded his stronghold on Anglesey where Cybi finally ended his days. This is the site that became known as Caer Gybi, in English, Holyhead. Cybi died on the 8th November around the year 554. His feast day is now generally celebrated on the 8th November, although other sources record it as being on the 5th. I went there. It was magical.